There used to be a day that Hotels actually advertised the TV experience in their rooms. Signs advertising Color TVs and the hotel TV experience were the norm. Since the advent of Satellite TV and HDTV however, most hotels provide a TV experience that is a shadow of what the hotel guests can get at their homes. With the advent of cable and satellite TV, in their homes most people have a great selection of channels and the falling cost of flat screen TVs has meant that for 70% of homes a 40+ inch HDTV is the norm. Because the renovation cycle is 7-10 years for most hotel brands and the encryption standards (Pro:Idiom) necessary to deliver HDTV signal to rooms, the hotel television experience has fallen further and further behind the average home. Limited Channel Selection – With Headend Systems often 24 or less! Small TVs, often not even high definition! Hotels have been at a disadvantage in providing guests with a comparable TV experience in-room since the advent of the digital HD TV signal and satellite and cable TV for several reasons. 1st – Digital Rights Management. Simply put, the need to encrypt to the all digital signal between the headend and the rooms. Pro:Idiom is the standard in HDTV encryption for the hospitality industry and it has meant expensive new equipment at the headend and HDTVs that run as much as 30% more than consumer models. 2nd – 7-10 Year Renovation Cycle. With the consumer side of TV changing at lightning speeds(Plasma, LCD, LED, and OLED TVs have all come to the market in the past decade), renovating your hotel every 7-10 years meant that by the end of your cycle you were years behind what consumers had available at home. 3rd – Increasing Channels Available on Satellite & Cable TV. Even the most basic satellite or cable TV package has hundreds of channels available to your guests at home. Delivering even 96 channels in a headend systems means multiple racks of expensive equipment. A Pro:idiom based HD Headend can run into the tens of thousands just for the Com1000 headend system. For a great explanation of why delivering HD to guests has been so hard and expensive for hotels before the DIRECTV DRE, read THIS ARTICLE on the Solid Signal forum. 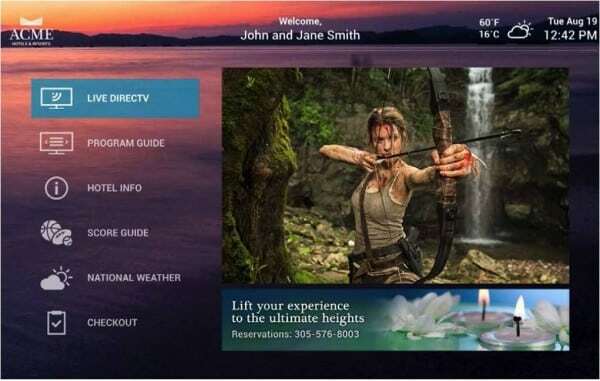 The DIRECTV Residential Experience for Hotels, or DIRECTV DRE, is quite simply bringing the TV experience your guests see at home into your hotel room. Your hotel guest can finally get a TV experience that matches what they have at home. For extended stay hotels, boutique hotels and any property that wants to extend the TV experience, DIRECTV makes HD-DVRs available as part of the DRE. Your guests can record and watch their favorite shows in your hotel room. The DIRECTV Residential Experience provides your hotel guests the same TV experience they have at home without the need for expensive Pro:Idiom headend equipment or expensive Pro:Idiom televisions. Better yet, the DRE is available with no upfront equipment costs. DIRECTV takes all the risk and you simply pay a small amount each month to cover the cost of the equipment over a 5-7 year term. DIRECTV even provides you with FREE receiver replacement and FREE remote replacement for the entire term. 50 programmable channels in the interactive guide that can be used as your HOTEL Welcome System. Provide a welcome screen, local events and restaurants and more to your guests as part of the DIRECTV Residential Experience system. Because each DIRECTV Residential Experience system is completely customized for your hotel down the the barrel connectors, getting a quote has meant that the DIRECTV Authorized Lodging and Institutions Dealer has had to to come to your property and do an extensive site survey and submit the sit survey to engineers art DIRECTV before the dealer could provide you with a quote. After installing thousands of DRE systems over the past year, DIRECTV is now providing Dealers with a Cost Estimator so they can quickly and easily provide you with an estimate of installation costs prior to doing a sit survey. This cuts weeks off your lead time to having your new DIRECTV Residential Experience system installed. Its all About Satellites specializes in DIRECTV for Lodging and Institutions. With over 20 years installing DIRECTV, we make expert installation affordable for Hotels, Motels, Assisted Living and Senior Care facilities, and the entire hospitality industry. ©2017 AT&T Intellectual Property. All Rights Reserved. AT&T, Globe logo, DIRECTV, and all other DIRECTV marks included herein are trademarks of AT&T Intellectual Property and/or AT&T affiliated companies. All other marks are the property of their respective owners.